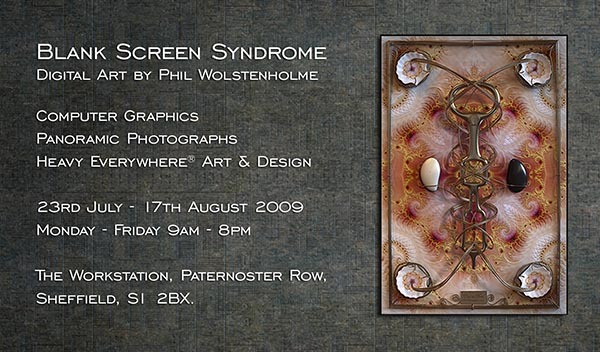 I'm pleased to announce that due to popular demand, my exhibition of digital artworks: Blank Screen Syndrome at The Workstation, Sheffield, has been extended for another two weeks, from July 23rd - August 28th 2009. 9am-8pm. The exhibition features a selection of my CGI work of the last 20 years, including classic album covers and music-related commissions, the Heavy Everywhere® fractal design range (wall-art, fabrics, fashion and product development), and also a selected preview of my large-scale hyper-real photography project Wide Area Network. Most works are for sale, some only in limited editions. In addition, luxury giclée art prints of the exhibition poster are available to purchase in a signed limited edition of 100, sized at 19" X 13" and printed by me on Crane's 'Museo' archival paper. Prints can be bought via the Workstation, or through this website, priced £40. "The breadth of material on show may puzzle those expecting a single theme or some overarching theory on which to hang an opinion (or indeed a review). But at a time when so much visual art relies for validation on mission statements and other textual baggage, it’s pleasing to find work that displays confidence in versatility and pure visual pleasure." Ground Floor: Heavy Everywhere® Fractal Art & Design. The Beat Is The Law print. First Floor: Album covers and other CG projects. Wide Area Network photographic prints. Special thanks also to: Bill Lawrence at Showroom/Workstation, Carole Crane and Paula Shirley at Artezone, Dave Robinson and Manjit Dosanjh at SENTA, Jonathan Jesson at BIG, The Lovers, Eve and Richard Wood at Sheffield Vision, Richard Annema and all at Splutterfish, Christiane Gondard and Sara Bonnaud at Chartreuse de Valbonne, Daniel Michel at Valcèzard, Steve Beckett at Warp Records, Ina DuFuss, Ian Anderson, Blair Harrison at SPIKE, Mark Watt, Dave Coldron at Lightwork Design, Adam Morris, Richard H Kirk, Graham Massey.